The abandoned baby was placed on a lawn chair and when found, he still had the umbilical cord attached. On May 25, 2014, Leslie Green from Port Huron, Mich., was out walking her dog, Ruby Rae, around 4:30 a.m. when the canine led her to a neighbor’s porch. There, a newborn baby boy had been abandoned wrapped in towels. 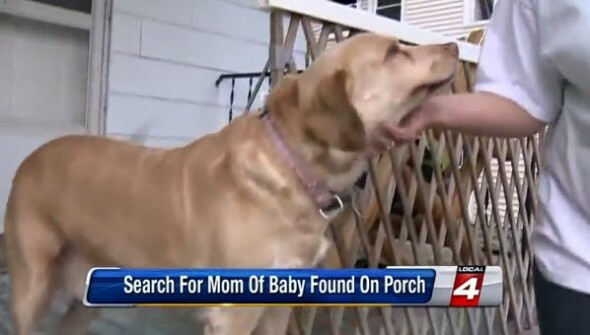 Thanks to the hero Labrador, the newborn baby boy was found and saved. Ruby Rae find newborn baby boy left in home’s front porch. The baby was placed on a lawn chair on a home in the 1200 block of 11th Street. When Green found him, he still had the umbilical cord attached. Authorities were called and the baby was rushed to Port Huron Hospital. Sgt. Dave Seghi told The Times Herald their priority at the time was to find the mother and make sure she is well. Officers canvassed the neighborhood for information on women recently pregnant, but they have yet to find the baby’s mother. Under Michigan law, “parents can leave an infant with an employee inside a hospital, police department or fire station up to 72 hours after birth,” but it is illegal to abandon a child on a home’s porch. Anyone with information regarding the baby’s parent can contact police at 810-987-6688. Thanks to the dog’s heroism and keen nose, the baby boy was found in time and saved. The newborn’s future could have been a very short one if Ruby Rae did not make the discovery. Another wonderful story about the heroism of animals and their nurturing instincts. The police could care less about the health of the mother, they just want to arrest her and disgrace her in public. Why don’t they just consider the baby found safely and move on. This is why babies get dumped in the trash or killed instead. This baby was cared about at least in some way, not the best, but let’s not encourage worse behavior. Police always have to be after the fact a-holes. Try to get them to help you prevent a crime, won’t happen. The police said they want to find the mother to make sure she is well, that’s a damn lie. If she wanted to live off the gov she would have kept the child. Take DNA, and put the DNA of the father in CODIS and a warrant out for his arrest too. He is equally responsible. Had he supported her, this wouldn’t have occurred. This is a one person crime. Most likely a very young person from a Middle Class family like the person calling for prison. Poor people have no problem with being a single parent, they grew up that way. Perhaps there was a reason for her decision (although not a particularly good one). Could be she is a young girl who got in trouble and had no where to turn or no one to turn to. Or, she could be not such a nice person. She left the baby in a place where it would be found and taken care of. She could have put it in a dumpster or a fish pond where, when found, would be too late.